Because this is what you do with all of that fig jam you just made! One of the things I am trying to do in this space is show you all how to utilize various ingredients in more than one way to stretch them, and your food $. 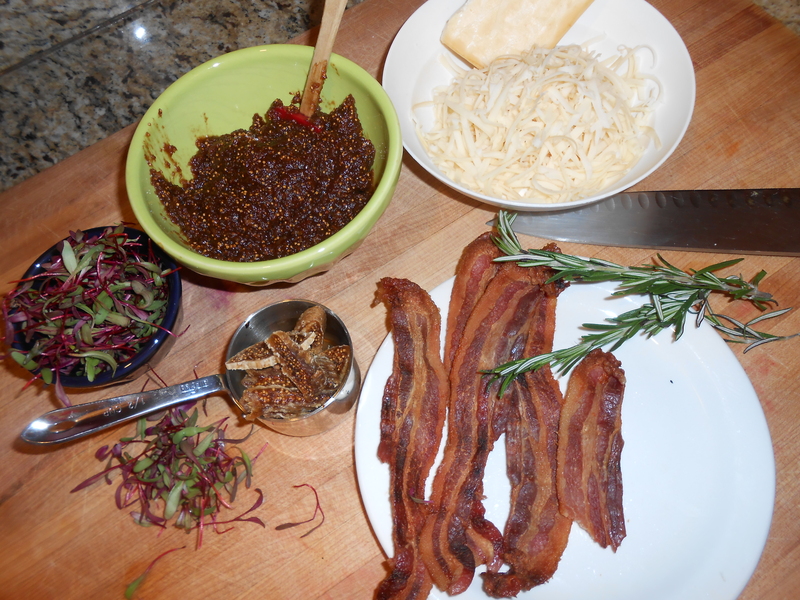 Don’t make fig jam just to let it rot in the fridge- USE it for all kinds of yummy stuff! A versatile condiment, it now adorns a perfectly sweet-salty pizza- just smokey enough to be interesting, just sweet enough to be begging for a little acid to make it perfectly punchy. We make our dough, using the “no knead” methods described by Deb over at the Smitten Kitchen. We sometimes buy our dough and there is no shame whatsoever in doing so. If buying dough- check out your favorite local pizza place- often they will sell you a ball of dough for pretty cheap and I find that pizza place dough > grocery store dough. What you need for this perfect creation: Pictured: BACON (I used all of the bacon pictured, and that half slice? 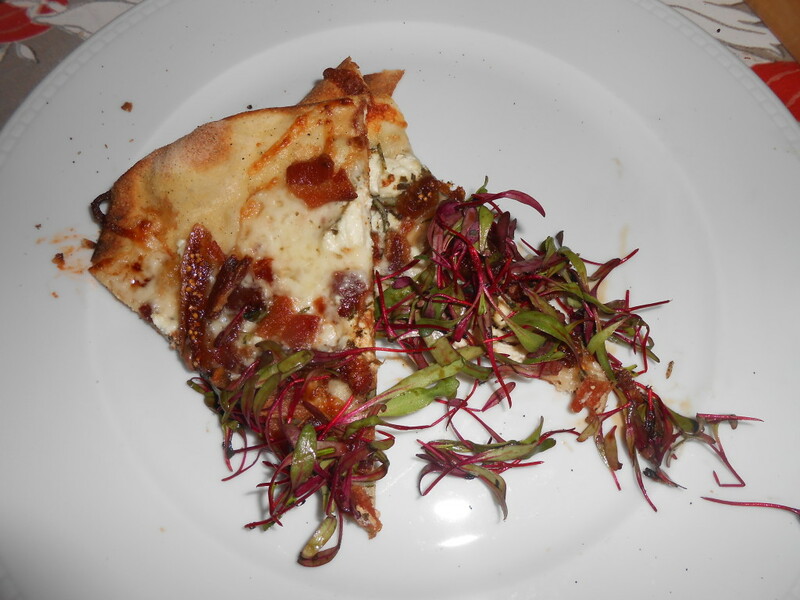 ?… guilty…), rosemary, cut up dried figs, fig jam- and off to the side some micro-greens that I literally had hanging around in my fridge (I know…pretentious). Not pictured: balsamic vinegar. 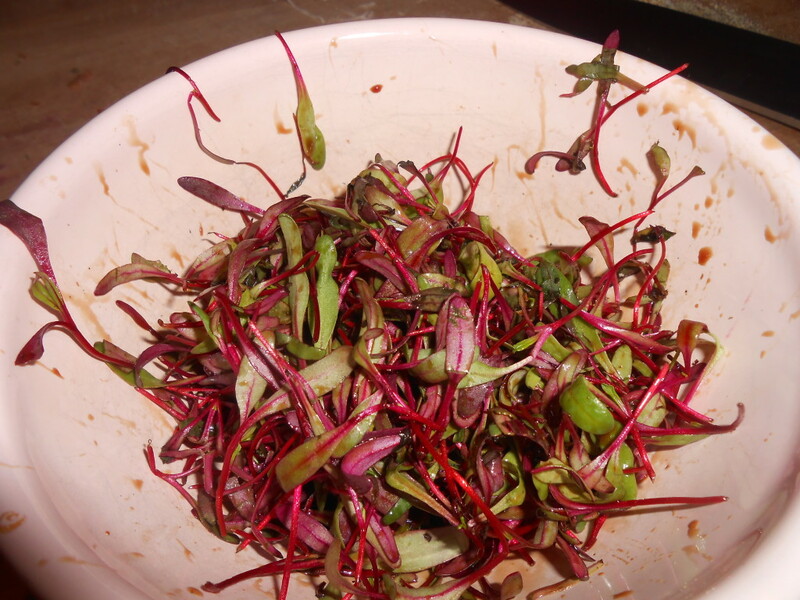 I jazzed up the micro-greens with literally just some vinegar, and it added the perfect kick. Method: We cook our pizzas on a baking steel (basically a thick piece of steel, like a pizza stone- but it actually gets hotter and conducts heat more effectively, resulting in a crispy crust in literally 6 minutes of baking)… so our steel and oven have been preheating together for about 45 minutes at 500 degrees. PS- the baking steel even crisps overloaded veggie pizzas. NO MORE MUSHY PIZZA! ahhh I love it. We dust our board in cornmeal. LOVE the texture, and it doesn’t dry out the dough like flour. Thin, thin, thin! One of the things I LOVE about the no knead recipe aside from the make it/forget it nature of the dough is that it stretches UBER thin. No fighting necessary! If your dough isn’t stretching nicely, let it rest awhile to relax the glutens. 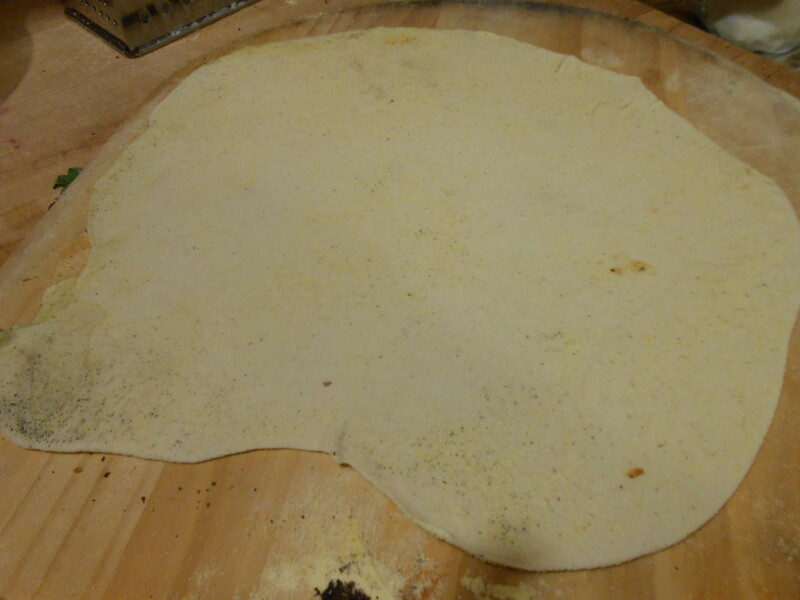 I also use my heavy marble rolling pin to get it thin… however Mike claims I use magic, since for whatever reason our pizzas are very different looking depending on who is stretching/rolling. No matter. No one is judging you! 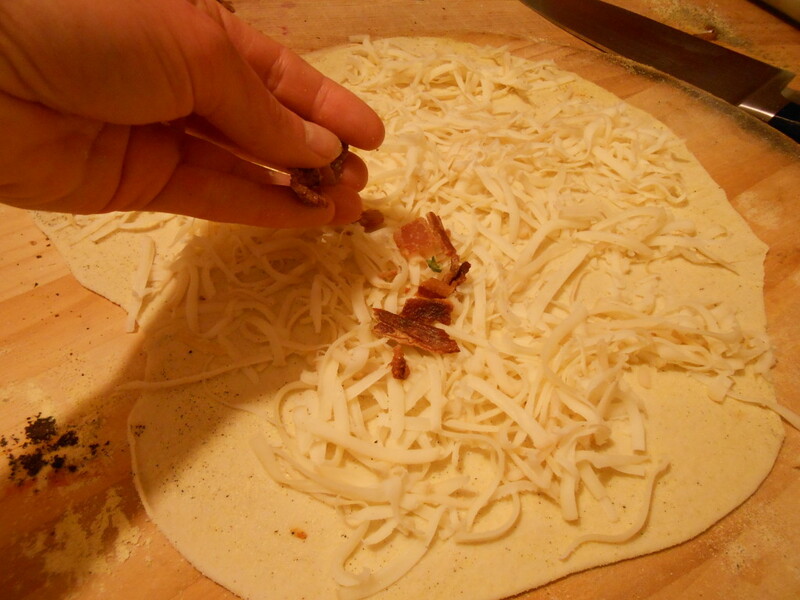 Get a nice layer of cheese right on the dough. 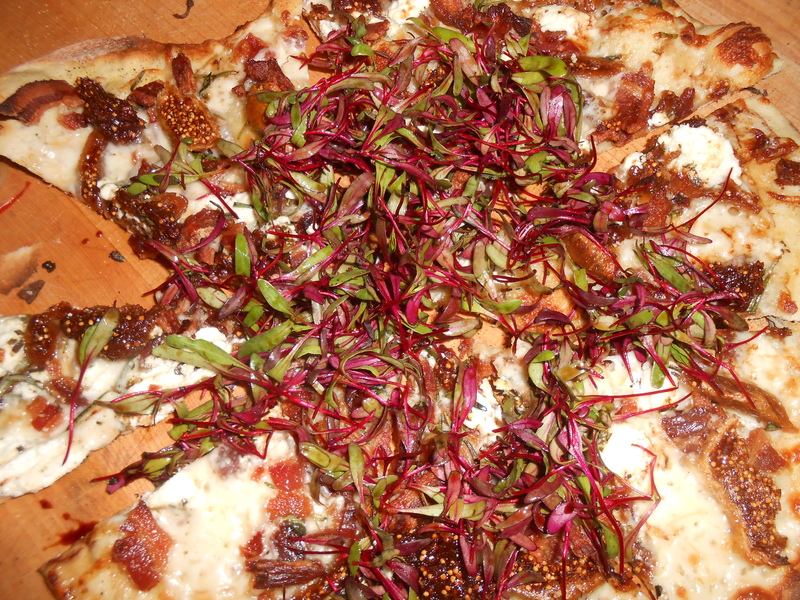 Sprinkle toppings throughout. For the jam- I took a teaspoon and spooned little mounds throughout the pizza, hoping that the melting cheese would spread it a little further, resulting in rivulets of jam. I was right. I wanted pockets of salty and sweet so that your tongue would stay interested- so one bite might be bacon and cheese, while the next might have some fig, etc. 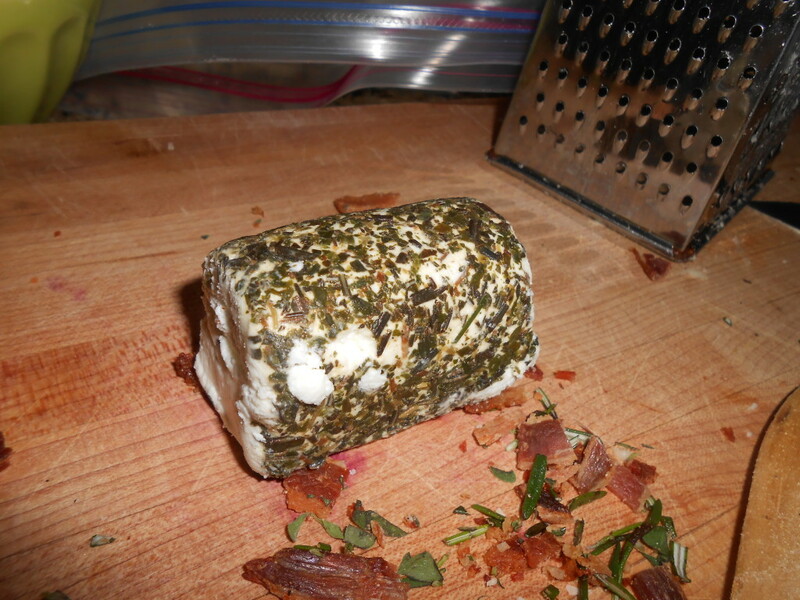 And then I decided to add some goat cheese. Why the heck not? 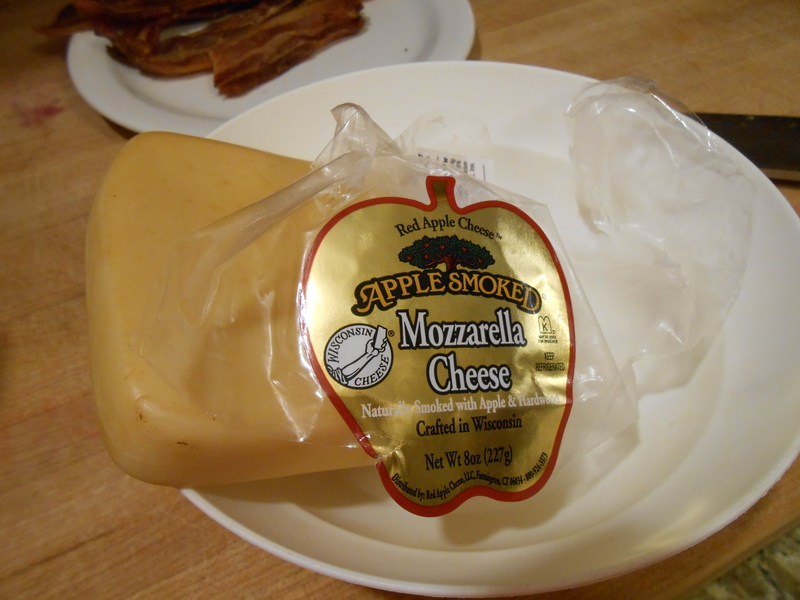 Yes, another true story is that I cut the slices a little too small and I use small plates often. That means that you get thirdsies if you want. I am famous for having lots and lots of small portions. *sigh*. Preheat your oven to 500, or whatever your preferred pizza-cooking temperature is (some stones/pans, etc come with their own sets of instructions, follow those!). 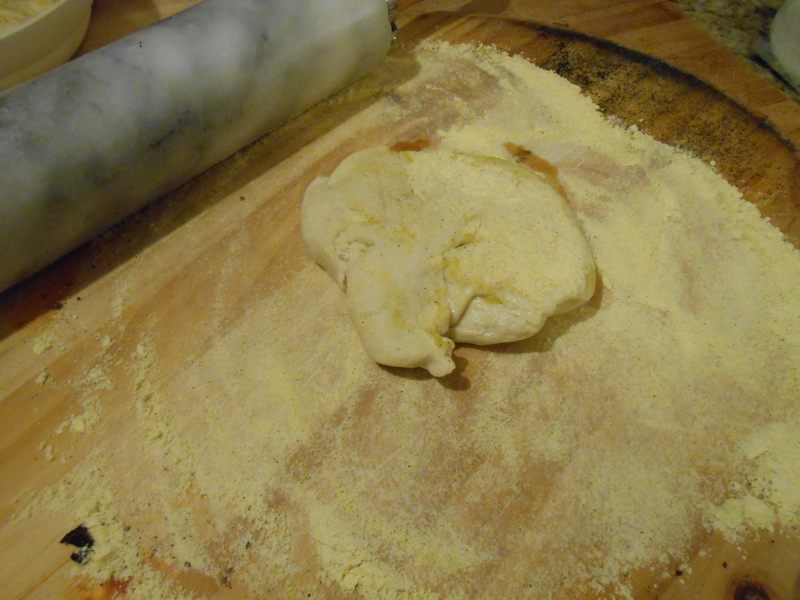 On your pizza peel (for easy transfer), spread some cornmeal out and roll your dough out super thin. 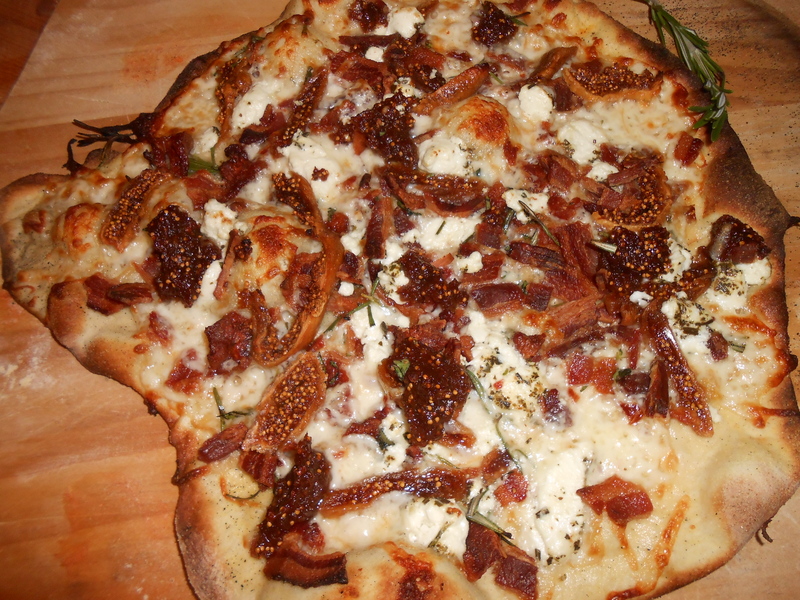 Sprinkle on bacon and rosemary; dollop on fig jam in small teaspoon fulls throughout the pizza. 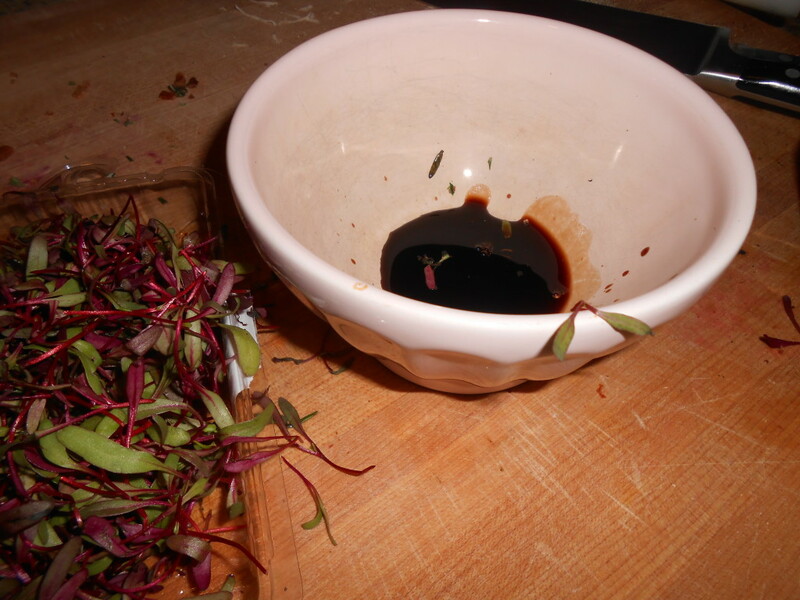 Assemble the salad: pour vinegar into the bottom of a bowl and toss greens through it. Season the greens with salt and pepper. Salad can be enjoyed on the side or on top! 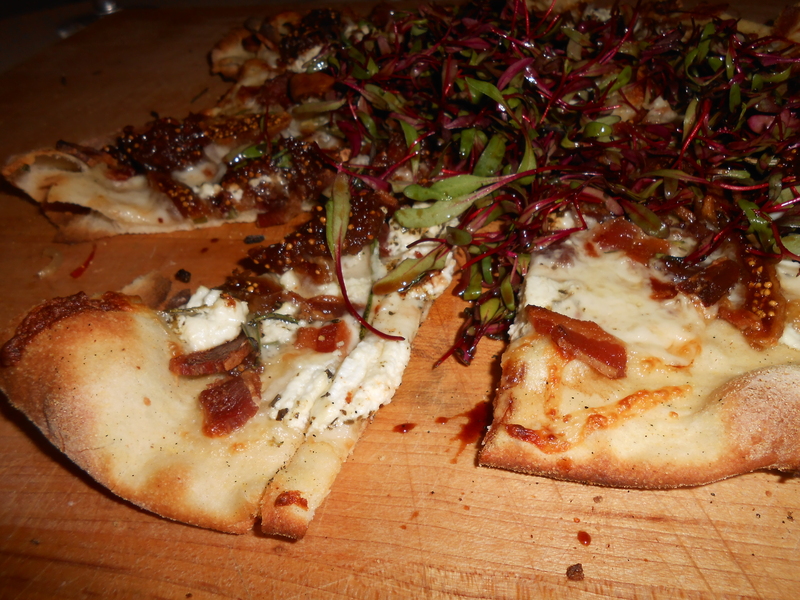 This entry was posted in Recipes and tagged fig and bacon pizza, fig pizza, figs, homemade pizza. Bookmark the permalink. 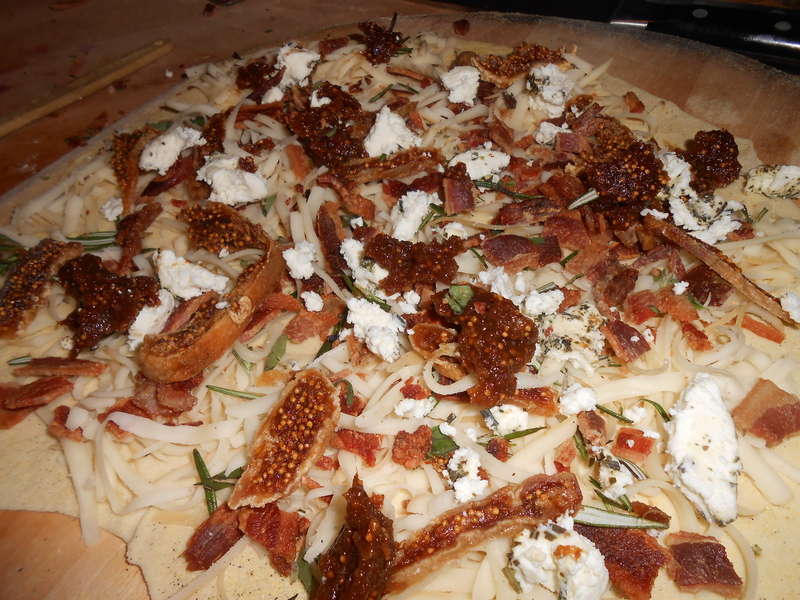 Fig, bacon and mozzerella is definitely an interesting combination! Maybe I will try it sometime. I love sweet and salty together- so this does it for me! A great way to try pizzas is to make a bunch of smaller ones- then if you hate one you didn’t commit to a huge ‘za! Ooooh yum!!! Thanks for sharing! Ps do you deliver? ?